Yo soy Mexicana Americana. Yup, I'm an American Latina. I'm proud to be a citizen of these United States of America, yet mi cultura, my culture is firmly planted in the history and art of my ancestors. Mamí has been telling me stories about mi familia for as long as I can remember and this is why I have become a storyteller myself. 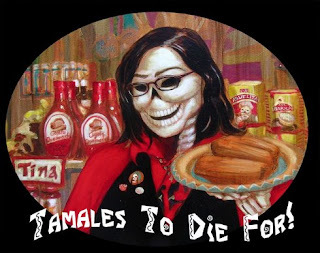 I'm explaining this so you will better understand the picture I'm so fond of using as my profile image, Tina Tamale Calavera aka Tamales to Die For aka Dead Tina (but mamí hates when I call it that and I always get scolded.) This image is a story in and of itself that I'm going to tell to you now. 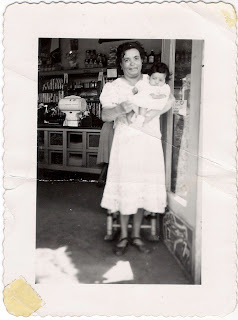 Photo "Grandma Rosa at the first La Borinqueña"
Mamí was born right here in West Oakland but her familia was originally from Jalisco, Mexico. Grandma Rosa grew up in a little pueblo, Atemajac de Brizuela, and never had a birthday cake. The first time I heard that, I was shocked...no birthday cake? I love birthday cake and usually have 2 or 3 during my birthday month so the mere though of no cake on the day of your birth, very hard for me to swallow. 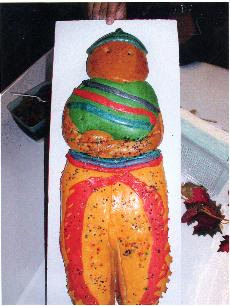 Turns out Grandma Rosa was born on Día de los Muertos, the Day of the Dead and instead of cake she always got a Pan de Muerto Monito with his panza (tummy) filled with raisins for her birthday. OK, so now I'm feeling at least there was a baked treat involved but his Day of the Dead business was not familiar to me. Lots of times, the more obscure holidays don't make it to America until someone "rediscovers" it. My immediate family didn't celebrate Day of Dead but I had heard of some celebrations and I was set out to find out what they where all about. Internet research, asking the mujeres that are on staff at La Borinqueña and then finding out that there has been an ongoing yearly exhibit at the Oakland Museum made me feel like a cultural archaeologist of sorts. You will hear me talk about this often, since I'm one of the younger members of my extended family, I have a lot of dead people in my life. Building a Day of the Dead altar at La Borinqueña every year and serving the food associated with the holiday like pan de muerto, chicken in mole, sweet tamales and atole made me feel closer to Grandma Rosa. Mamí finds this very interesting since my grandmother passed away before I was born and I never met her yet I feel very connected to her all the same. Photo by Sue Richardson "Cheesy Tina"
This connection made me want to do something a little taboo. My friend Sue Richardson had taken a photograph of me to use in a promotion that I really liked, let's call this picture Cheesy Tina. But, what I really wanted was this to be made into an old school Día de los Muertos painting, the only problem was that according to my Latin culture only people who have passed on in life can be depicted as a calavera. Amazingly, I was able to find an Latino artist that is Americano too. He warned that not everyone was going to get it and that some folks might also find it disturbing. But he was open to being commissioned to do the painting and was excited to do it. Photo by Sue Mark (10,000 Steps) "Tina x 2 at current La Borinqueña"
So this is how Tina Tamale Calavera was "born" and has become an image that I am strongly attached to and love. Joaquin Newman, the artist, was correct that some folks don't understand and are "weirded out" by it. He gave a hearty chuckle when I put the "Tamales to Die For" under it to make it more socially acceptable. Unfortunately, I don't get the opportunity to give the explanation as I've detailed here very often. If you didn't already know this story, I'm happy I got to share it with you now. Tina Tamale Calvera is literally a snapshot of who I am celebrating history, food and my personality the moment you look at this image and appreciate the artistry. To read my Oakbook article about my painting and Día de los Muertos go here.